Peacocks are such beautiful birds. Inspired by their magnificent appearance we decided to make a paper doily peacock craft. 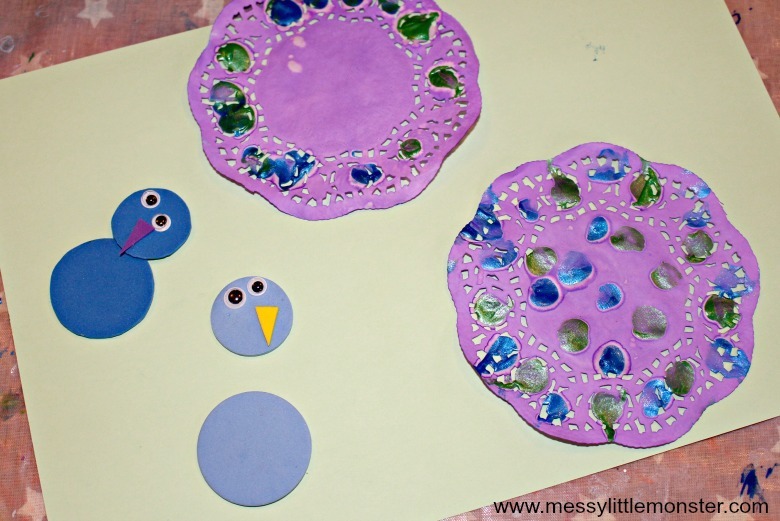 This craft was easy to make and is perfect for kids of all ages. Peacocks bright green and blue feathers make them look really impressive. We decided to add a little twist to our craft by adding purple too! 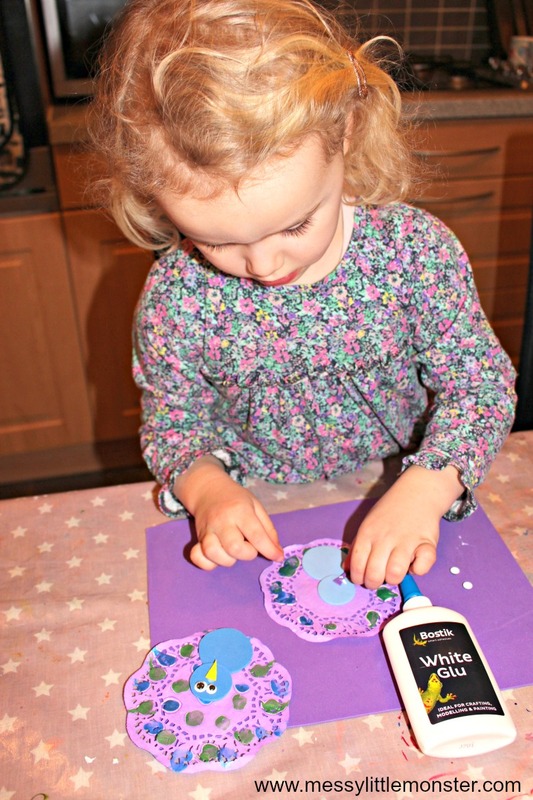 Toddlers and preschoolers will love adding their painty fingerprints to the colourful paper doilies. When I think of peacocks it makes me think of sunshine and being outdoors. With Spring on it's way hopefully we will be able to get outdoors a little more over the next few months. Take a look at our Spring activity calendar for lots of spring themed craft and activity ideas for the kids. Peacock themed crafts look beautiful, but other bird crafts can be just as colourful. 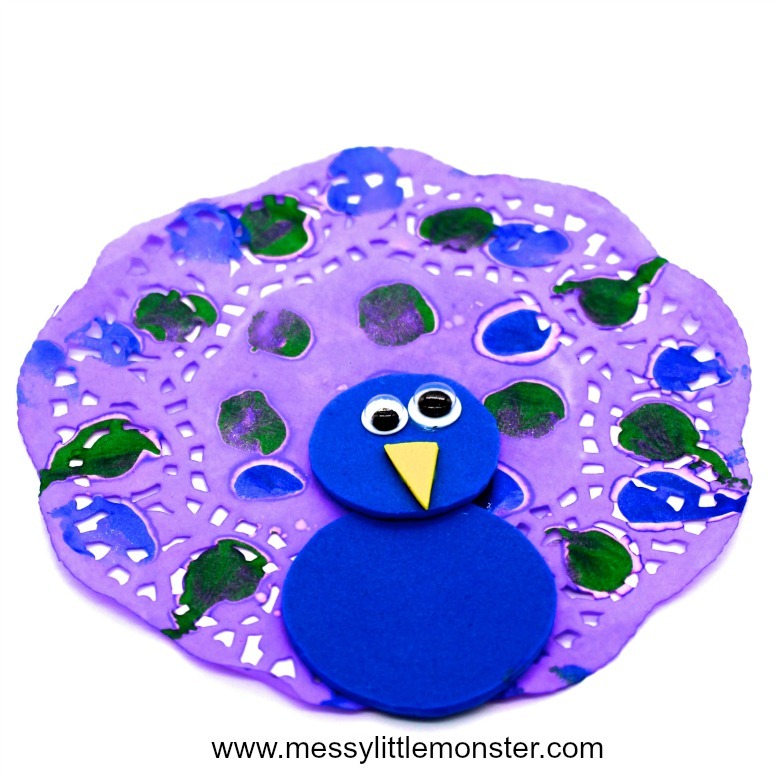 We made some brightly coloured bird puppets using bottle tops which are perfect for toddlers and preschoolers to make and play with. 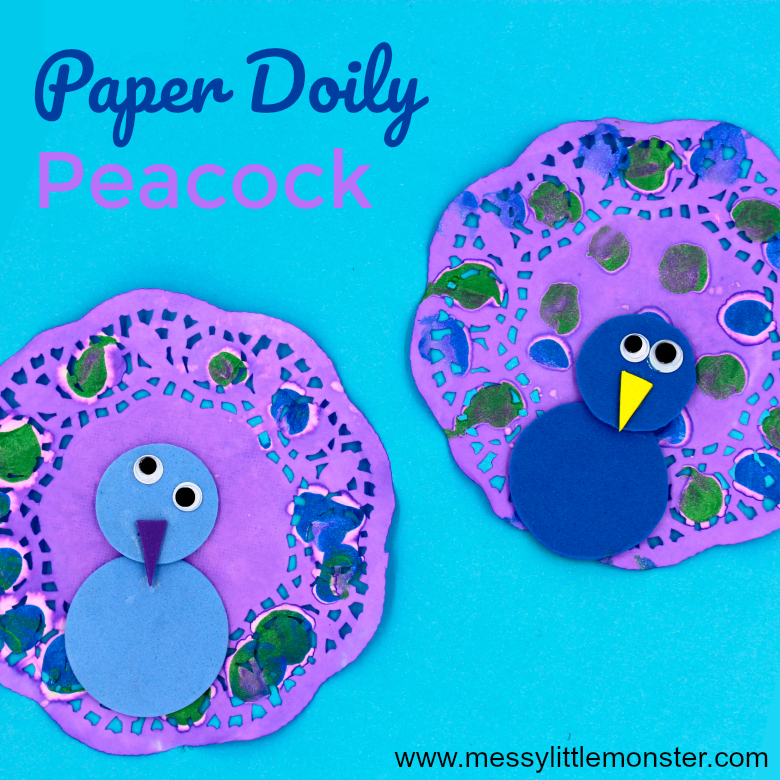 If you added some blue and green feathers these bird puppets could be turned into cute peacocks too! If you are looking for more bird themed activities for your children take a look at our salt dough birds and our easy DIY bird feeders. Before starting our peacock craft we had a look at a few peacock images. We looked at the feathers and talked about the colours. 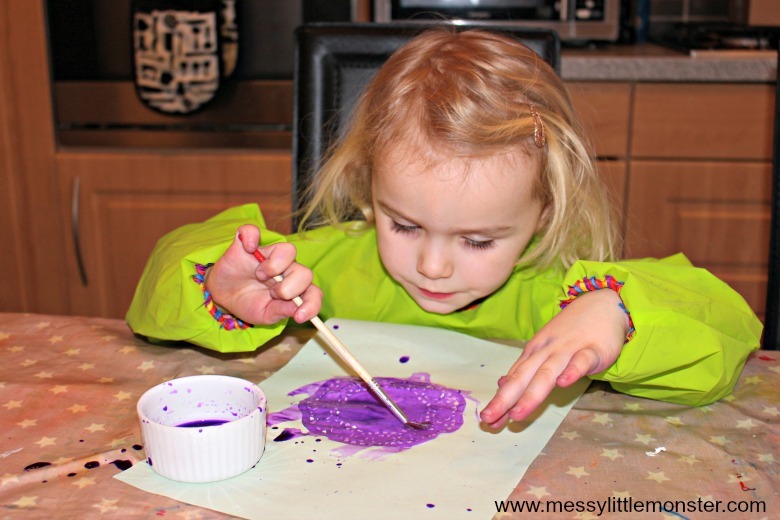 We were going to paint the paper doilies green but then Daisy saw the purple paint and wanted to use purple instead. I love this colour combination! Begin by painting your paper doily with liquid watercolour. We are really loving using liquid watercolours at the moment as the paints are so bright and colourful and easy to use. You could use purple paint as we have or take a look at some images of peacocks and picks one of the colours you can see in their feathers. Painting the paper doily a mixture of the colours could work well too. Once you have fully covered the paper doily with paint leave it to dry. 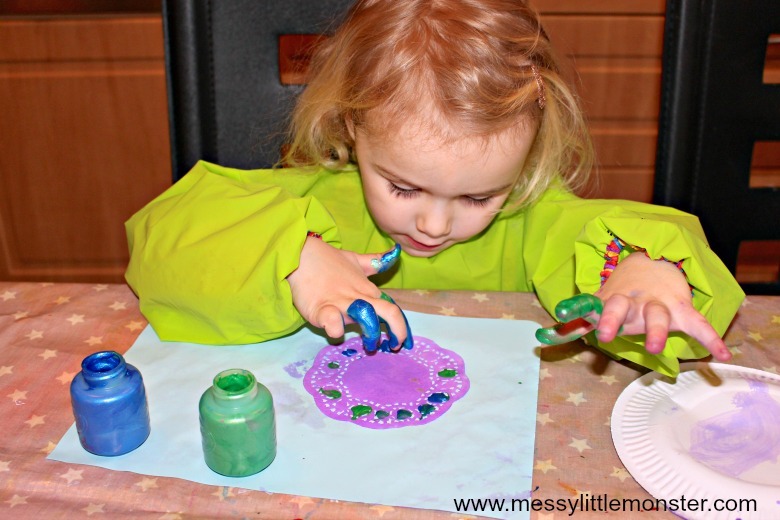 Using green and blue metallic paint use your fingers to finger paint across the paper doily. You could either space them out around the edge or fill the paper doily with fingerprints. These will look like the 'eyes' on peacocks feathers. Leave the artwork to dry. You might notice that on our peacock there is a ring of white and then a darker shade of purple outside of each fingerprint. This wasn't planned, it just appeared as the artwork dried, but I think it adds to the overall effect. For the next part of the craft you will need to make a body for the peacock out of craft foam. We were lucky as we had some foam circles that were sticky on the back. You could either use foam stickers like we did or cut shapes from craft foam yourself. 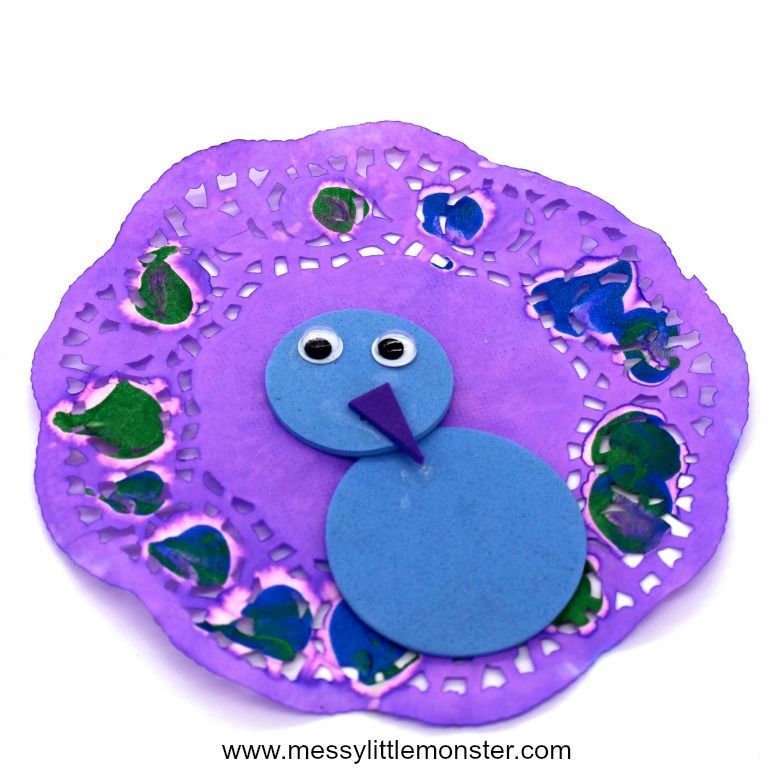 Using a small circle and a larger circle keeps it simple, but you could experiment with cutting out different shapes to represent the peacocks body. Stick the peacocks body onto the paper doily. Add two googly eyes and a beak. For this activity I gave Daisy the tube of glue to squeeze on herself. This made her feel more grown up and independent and is great for working on hand strength. There we have it. That is how you make a beautiful peacock craft from a paper doily. I think that you will agree that these peacocks look adorable. 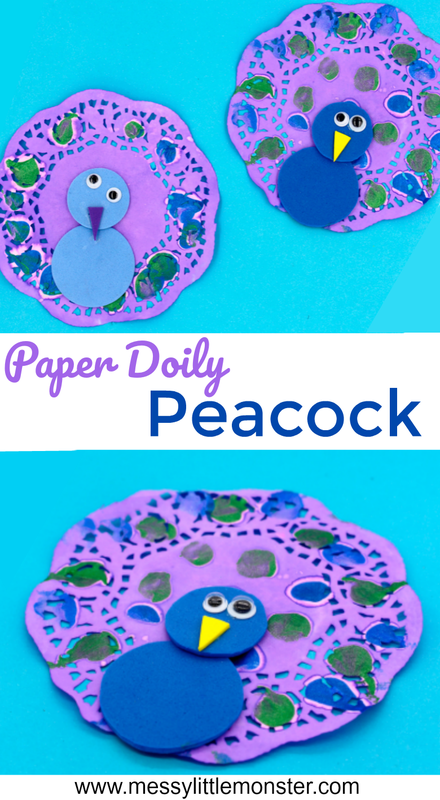 We love easy activities like this peacock craft. If you enjoyed making this you will enjoy exploring all our other craft ideas. 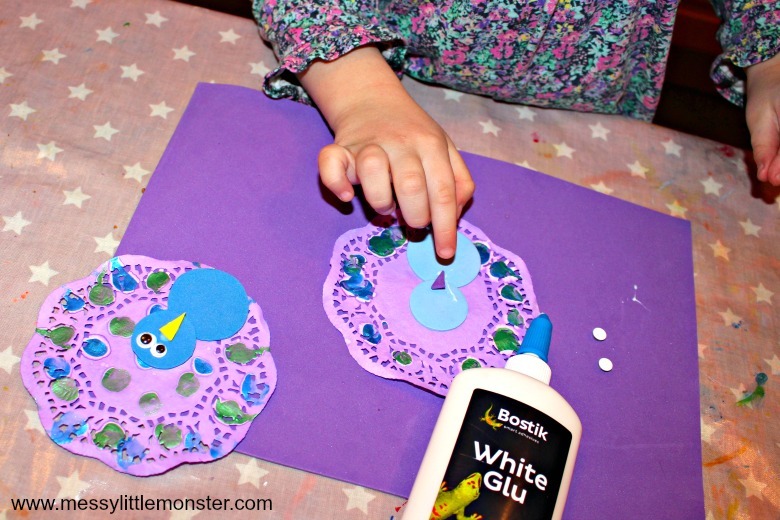 Disclosure - We were sent a box full of craft materials from bostik including the glue used in this activty.